Recognized by their brightly color uniforms, Swiss Guards protect the Pope as well as guarding the entrances to the Vatican City. Historically, part of the Swiss Cantons, skilled and resourceful soldiers-for-hire, the Swiss Guards were created when they arrived at the Vatican in 1506 to protect the pontiff and the city. At that time, Europe was a volatile continent with the constant threat of attack from others. After more peaceful times arrived, the Swiss Guard became more ceremonial than military, but with assassination attempt on Pope John Paul II in 1981, that focus has changed to protective. Their extensive training in unarmed combat and small arms has made them the Secret Service of the Vatican. Today’s Swiss guards are Swiss men between the ages of 19 and 30, practicing Catholics, who have vowed their own lives to protect the pope. 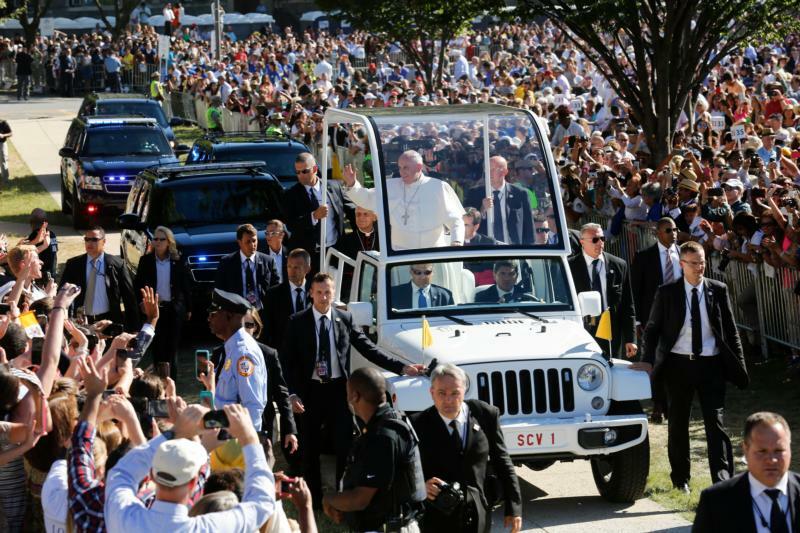 Although missing the familiar uniforms, the Swiss Guard in plainclothes has accompanied the Pope to the U.S. and everywhere he travels to provide papal security and protection. Although Pope Francis has proven challenging to protect, as he insists on being with the people, even stepping out into crowds or taking a ride through Central Park, the Swiss Guard is again adapting to the change of policy and continuing to protect the Holy Father.